Sir Tim Lankester is a member of our Management Board. After a distinguished career with HM Treasury, the World Bank and IMF, and as Private Secretary (Economic Affairs) to Prime Ministers James Callaghan and Margaret Thatcher, Sir Tim re-entered the world of academia as Director of SOAS and then President of Corpus Christi College, Oxford University. 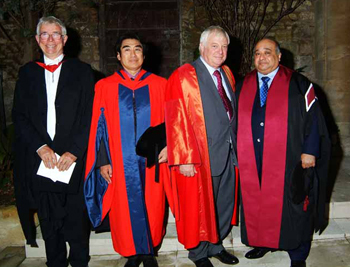 As SOAS Director, he played a significant role in the establishment of the Sainsbury Institute. He is currently Chairman of the Council of the London School of Hygiene and Tropical Medicine, and until recently he was Chairman of the Board of Governors of London Contemporary Dance. An economist by training, he currently advises the consulting firm Oxford Analytica on Indonesia. For this e-magazine edition, we asked Sir Tim on his involvement with Japan, what he believes are the values of arts and cultures in the society we live in, and his vision for the Sainsbury Institute. The Institute has benefitted tremendously from your guidance—from establishing and strengthening our partnership with SOAS when you were Director of SOAS to receiving advice on the future path of the Institute. Your involvement with Japan, however, predates that with the Institute. How did you get involved with Japan and where does this involvement figure in your multiple activities? My first encounter with Japan was in the economic sphere. I took a course in Japanese economic history as an undergraduate at Cambridge, and was fascinated by Japan’s success after the Meiji Restoration in rapidly catching up with the West. As a young economist at the World Bank in the 1960s, it struck me that Japan’s “catch-up” strategy had many lessons for the poorer countries of Africa and Asia. Then in the 1970s as a Treasury official trying to grapple with the problems of Britain’s then sclerotic economy, one could not but be struck by Japan’s astonishing growth rate. We all wanted to know how Britain could emulate it. Easier said than done: Japan had much higher levels of savings and investment; a superior ability to translate technology into new products especially for export markets; and a much more constructive management and labour culture. In 1977 I visited the recently built Sony factory in south Wales, and was hugely impressed by the way in which the Japanese managers “mucked in” with the workers on the production line – one of them even spoke Welsh. 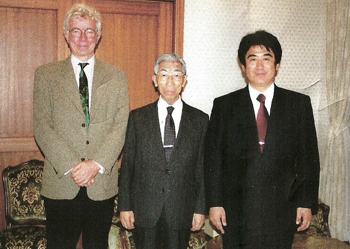 In the 1980s I had close working relations with my Japanese fellow directors on the boards of the IMF and World Bank – the two Y’s: Messrs Yamazaki and Yamaguchi. By this time, Japan had far overtaken Britain as an economic power; yet unlike the attitude sometimes of my American colleagues, theirs was always one of cooperation and mutual respect. Later, as a member of the British team – the so-called Sherpas – at a preparatory meeting for the 1989 G7 Economic Summit in France, I found myself offering moral support to the Japanese Sherpa who was in a state of total exhaustion from having to travel from Tokyo to Saint Martin in the Caribbean so that the French could show off their little bit of paradise. Then in the mid 1990s when I became Director of SOAS my interest in Japan switched from economics to culture. SOAS was especially strong in Japanese literature, religion, music and art, and I took advantage of this. I tried learning Japanese but was told by my excellent teacher, Mrs Yoshiko Jones, that unless I did more home-work, I might as well pack up. So I did. But this didn’t stop me exploring Japanese literature in translation, and I started to read widely: The Tale of Genji, and the modern novelists Natsume Soseki and Dazai Osamu (my two favorites), Tanizaki Junichiro, Oe Kenzaburo, Ibuse Masuji and Murakami Haruki. They opened up a new and fascinating world for me but also a familiar one insofar as all of the novels I read address the human condition in one way or another. I travelled to Japan with SOAS’s celebrated Chikamatsu (Japan’s Shakespeare) scholar, Professor Andrew Gerstle, and he introduced me to Bunraku, traditional Japanese puppet theatre, and to Kabuki. In Osaka we met one of Japan’s greatest Kabuki actors, Ganjiro the Fourth, in his dressing room after a performance. He told us about the time he had performed in London with Sir John Gielgud. On another trip, this time funded by the Japan Foundation, I had the privilege of meeting Prince Mikasa, uncle of the current emperor, an expert in Middle East archeology and SOAS honorary fellow. In music, I became greatly attached to the soulful sounds of the shamisen, performed at SOAS’s annual graduation ceremony. In the fields of Buddhism and Shintoism respectively, I helped develop fruitful collaborations with the Agon Shu Foundation in Kyoto and with benefactor Dr Handa Haruhisa in Tokyo. And I became fully aware of Japan’s rich and wonderful history in the visual arts. Of course, I was familiar with the endless reproductions of Hokusai’s Great Wave and I had seen and admired the pottery of Bernard Leach’s great collaborator, Hamada. I knew of the great influence of Japonisme on late 19th century European art and on architect/designers like Charles Rennie Mackintosh. But beyond these, my knowledge and understanding of Japanese art were more or less a blank sheet. This all changed at SOAS where I got to know three outstanding art historians of Japan — Timon Screech, Nicole Rousmaniere and John Carpenter. With their guidance and encouragement, especially Nicole’s, and through visiting the many Japanese collections in museums in Britain, Japan and the USA, I learnt to love and admire a whole range of Japanese painting, pottery, textiles and calligraphy. Nicole Rousmaniere was of course pivotal in securing the initial collaboration agreement between SOAS and the Sainsbury Institute which, in modified form, remains in place to this day. It certainly helped that, when as prospective Sainsbury Institute Director she approached me, I was already becoming increasingly interested in Japanese art. But the collaboration that she and I negotiated back in 1998, which involved the sharing of financial, staff and library resources, made perfect sense for both SOAS and the nascent Institute. Access to SOAS’s library and research activities was good for the Institute – indeed essential in those early years; and SOAS was able to benefit from the Institute’s superb visiting fellows, lectures and exhibitions. The collaboration was a win-win for SOAS and for the Sainsbury Institute. In a world where collaborations can be meaningless or cantankerous, it proved itself a model of its kind. The linkage is no longer as important as it was for the Institute as the latter has matured and built up its own library and scholarly reputation; but it remains important for both institutions. My involvement in negotiating the original deal and then assisting in the Sainsbury Institute’s early development is one of the things I feel most proud of from my time as SOAS Director. But the main credit of course has to go to Sir Robert and Lady Sainsbury for their generosity and to Nicole Rousmaniere, supported by Dame Elizabeth Esteve-Coll, for their inspiring early leadership. When I left SOAS in 2001 and moved to Oxford, I was happy to be invited to remain a member (strictly speaking an Observer though it feels no different from being a full member) of the Sainsbury Institute management board. There I have remained ever since and it has been a pleasure to witness and occasionally guide the continuing development of the Institute first under Nicole and over the past few years under the leadership of Mami Mizutori. It is remarkable how in only 15 years the Institute has developed a world-wide reputation and is able to attract scholars from all over, as well as playing an important role in spreading the word in the regional community and beyond about the marvels of Japanese art. As a campaigner for education and humanities research, can you tell us what you think is the value of research and outreach activities in the field of arts and cultures? What do they bring to the society we live in? Science and technology are vital for our health and for our economic well-being, and for understanding the mysteries of mankind and the universe. But if we are to flourish as human beings, we need the arts – history, literature, dance, music, painting and much more. With access to these, we flourish as individuals and we do better as a society. We all know of wealthy communities that don’t really seem to flourish; and that is so often because they are oblivious to beauty and creativity. Equally, those who have travelled in the poorest countries are aware that their communities are not quite as miserable as the economic indicators might suggest because the arts – musical performance, drawing, painting, dancing, story-telling – are alive and well. I am an economist by training and interested in economic indicators; but there is something crucial that is missing in these indicators. None of the conventional indicators of welfare – per capita income and even the UN’s Human Development Index – adequately capture creativity and society’s involvement in the arts. Simply drawing in a passive way on what already exists is not enough. As individuals we need to be educated in the arts so that we can have our eyes, our ears and our minds opened and our appreciation enhanced. This is why arts education is so important – so that we can improve our awareness, our knowledge and our understanding of our rich national and global heritage. And education alone is not enough. We need a vibrant community of research scholars to uncover the unknowns and revise or improve hitherto accepted theories and understandings. Too many governments, including our own, fail adequately to fund education and research in the arts because they don’t sufficiently appreciate how important the arts are for a flourishing society or because they can’t readily measure its “impact” (the recent buzz-word in government thinking on research funding in the UK). Yet as Aristotle observed in his Nicomachean Ethics, “It is a mistake to look for greater precision than our subject matter (whatever it may be) permits”. The immeasurable can be just as, or even more important than, what can be measured. Former US Defense Secretary Robert McNamara admitted late in his life, when looking back on America’s failure in Vietnam, that he had placed far too much emphasis on numbers – the “body count” – and not enough on the immeasurable feelings of the Vietnamese people. Failure of governments to recognize the immeasurable in relation to the arts might not have such catastrophic consequences, but over time it will imperil the flourishing of our societies. What does the Sainsbury Institute bring to the academic community of this country? What kind of opportunities and challenges do you see for an institution dedicated to the study of Japanese arts and culture? The Sainsbury Institute is unique in this country: no other institution has created such a great admixture of research and public education in the field of Japanese art. It has meant a step-change in scholarly work on Japanese art not only in the UK but in Europe as a whole. And it has all happened in such a short time. Just as the Institute’s collaboration with SOAS has been so beneficial, I would like to see closer links with the University of East Anglia and its many excellent art historians, and with the Sainsbury Centre for Visual Arts. Visiting scholars to the Institute would certainly benefit if there was more interaction. Whereas the Institute’s current building on the Cathedral Close has superb facilities and has a wonderful feel about it, its distance from the UEA campus does inhibit closer links on a day-to-day basis. My dream would be for a new dedicated building for the Institute and its burgeoning library in close proximity to the Sainsbury Centre; and whilst retaining its semi-autonomous status, integration of its research and education activities into those of the university. A major challenge is to find a way for the Sainsbury Institute to carry on when the very generous recurrent funding from the Sainsbury family begins to wind down in a few years time, and also to find the money if there is to be a new building for the Institute on the UEA campus. On both counts – recurrent funding and capital – there will need to be fund-raising on a major scale from public bodies and from private donors. Under Mami’s leadership, this effort is under-way. Having been involved in fund-raising at SOAS and in Oxford, I know this will not be an easy task. But success will be vital if the Institute is to have a long term future. All of us who realize and admire just how far the Sainsbury Institute has come, and so quickly, will need to impress on potential donors in the UK and abroad what a loss it would be if the Institute were allowed to atrophy, and its great potential going forward if the necessary funding can be secured.